Dr. Kulbir Manhas is a Royal College of Dental Surgeons certified Periodontist. Born in Winnipeg, he has trained at both universities of Manitoba and Toronto where he had a cumulative GPA of 4.25 during his undergraduate degree and received scholarships at both universities. After 9 year of university, he worked as both a Dentist from 1999-2007 and as a Periodontist from 2007-present. Having a broad scope of dental experience provides Dr. Manhas with an integrated approach to planning and treatment provision for a seamless transition from his referring offices. 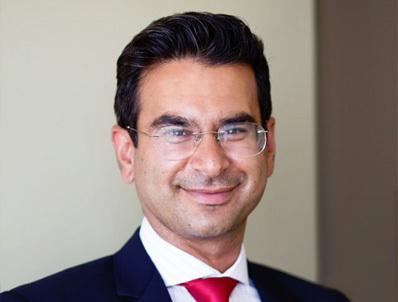 Dr. Manhas understands the importance of life-long learning, as he has was a clinical instructor at the University of Manitoba Dental Diagnostics and Surgical Sciences department from 2002-2014. He has been an executive board member for the Manitoba Tobacco Reduction Association and the Professional Conduct Committee in Saskatchewan. He has provided seminars for continuing education of Dentists, Denturists and other Specialists by co-leading study clubs and educational events since 2007. His family includes a wife and child that are in Calgary as well as extended family in Olds, AB and Winnipeg, MB. With interests which include: biking, hiking, and travelling, Kulbir finds his life to be balanced with work, social engagements and family.